Southwest Air Adventure is an Event Course in Super Mario Maker, released on January 6, 2016, and created by employees from Southwest Airlines. It unlocks the Sky Pop Mystery Mushroom costume upon completion. The level begins in an area with two lifts along with some Hard Blocks meant to resemble a Boeing model, complete with Burners. After a trampoline and some coins in the shape of a heart, a row of Hard Blocks appears along with some Koopa Paratroopas, followed by blocks resembling seats and bag storage areas. After some pipes containing Piranha Plants, the Checkpoint Flag is reached, along with some Para-Beetles. 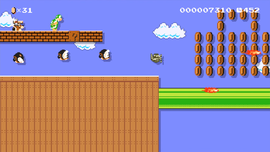 After a segment with Rocky Wrenches and Hammer Bros, Mario will reach an area with many enemies, including Bowser, as well as the staircase to the Goal Pole. Take to the skies through an adventure course designed by Mario fans from Southwest Airlines! Clear it, and you'll unlock an exclusive Mystery Mushroom costume based on the Sky Pop airplane from Super Mario Land! This page was last edited on October 7, 2018, at 17:26.